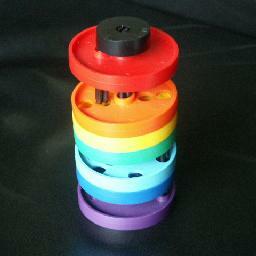 The Dizzy Rainbow puzzle consists of 7 discs on a long central peg. The bottom disc is fixed to the peg so that it acts a a base, and there is a cap at the top of the peg to stop the puzzle from coming apart. The base disc has two further pegs of differing lengths sticking upwards, and the other discs have various holes in them to accommodate those pegs. Similarly, the top disc has two pegs attached of different lengths that stick downwards, and these also have to fit in the holes of the middle discs. The aim is of course to arrange the discs so that they form one solid cylinder, so at every level the pegs must fit into the holes. The holes in the discs lie on the corners of two concentric hexagons. The holes that lie on the outer hexagon are used for the pins on the base disc, while the holes lying on the inner hexagon are for the pins attached to the top disc. The exact arrangement of holes and discs is shown in the diagram below. The numbers in the diagram show the length of the pins (the number of holes they have to go through). The central pin is not shown. The Dizzy Rainbow was invented by Dmitry Zlotsky, and patented on 24 September 1996, US 5,558,331. Unfortunately he did not manage to sell this puzzle to a toy company, so it was never manufactured commercially. He paid for the manufacture of a first prototype batch of pieces, enough pieces to make about 5000 puzzles. I bought one of those from Dmitry through an eBay auction. This puzzle does not really have different positions, so it is not possible to count them. However, to get some measure of the difficulty, we can reason as follows. When moving one of the discs up or down onto two pegs, its holes usually only allow this to be done in two ways. There are 6 loose discs to contend with, giving about 26=64 ways. This shows it is not a very difficult puzzle, though I feel it is actually somewhat harder than this number indicates partly because it is a tricky puzzle to manipulate. There is only one solution, shown below.